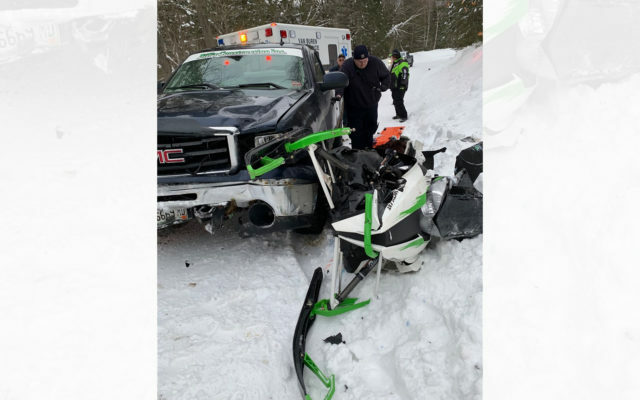 The driver of a snowmobile who was unable to see a stop sign crashed into a pickup truck on East Road in T17 R3 WELS on Monday, Feb. 4, according to the Maine Warden Service. T17 R3 WELS, Maine — The driver of a snowmobile who was unable to see a stop sign crashed into a pickup truck on East Road in T17 R3 WELS on Monday, Feb. 4, according to the Maine Warden Service. Mark Sutherland, 48, from Sterling, Mass., was traveling on connecting trail 96 at around 3:30 p.m. when he failed to stop at the intersection of East Road and crashed into a pickup truck which William Laplante was operating. Laplante, 68, of of T17 R3 WELS, was traveling west through the same intersection when the snowmobile struck his vehicle. “Sutherland struck the front grill and bumper as well as the plow frame of the truck. The impact was significant enough to spin the truck completely around,” according to Corporal John MacDonald of the MWS in a press release. Sutherland was wearing a helmet, which broke from the crash impact. Van Buren Ambulance transported Sutherland to Cary Medical Center in Caribou for treatment of a broken leg, possible pelvis injuries, and possible broken ribs. Laplante as not injured. Current snow depths are unusually high for this time of year and have made trail intersections dangerous in the area, according to Warden Adrian Marquis. The stop sign intended to warn snowmobilers of the upcoming intersection between the trail and East Ward was obscured by deep snow and overgrown tree limbs. Gateway Snowmobile Club, who maintains the portion of trail where the crash took place, is currently working to make the intersection more visible and clearly marked, according to MacDonald. The Maine Warden Service urges snowmobilers to use extreme caution when intersecting and crossing roadways.